National Retail Foundation: A combination of pent-up demand and a growing population of school children put 2012 back-to-school spending in the history books, leaving parents in 2013 with an array of school supplies that still work, and a significantly shorter shopping list. According to NRF’s 2013 Back-to-School Survey conducted by Prosper Insights & Analytics, families with school-age children will spend an average $634.78 on apparel, shoes, supplies and electronics, down from $688.62 last year. 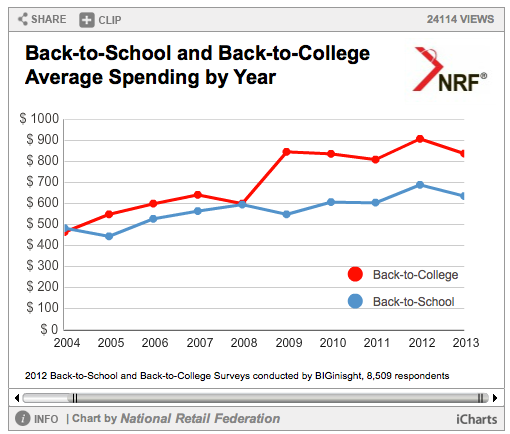 Total spending on back-to-school is expected to reach $26.7 billion. The biggest portion of back-to-school shoppers’ budgets will go toward new apparel and accessories: 95.3 percent of those with school-age children will spend an average of $230.85 on fall sweaters, denim and other chic pieces of attire. Additionally, families will spend on shoes ($114.39) and school supplies ($90.49). Fewer families with children in grades K-12 will purchase electronics (55.7%), and those that are going to invest in a new tablet or smartphone are going to spend slightly less than last year ($199.05 vs. $217.88 in 2012).